There are many different ways that you could keep a guinea pig cool during hot weather. As the weather warms up after a cold winter and into the coolness of spring it brings the prospect of the other extreme, a hot summer. Guinea pigs love an ideal temperature range of between 50 degrees to 77 degrees Fahrenheit and so if the temperature goes either side of that range, then measures need to be taken to protect our piggies from extreme cold or hot weather. Guinea pigs are good survivors and will do all they can to help themselves, but they could sure do with a hand if things get a little uncomfortable for them. We’ve looked at so things you can do for piggies in cold weather. So here are 20 ways that you can keep a guinea pig cool in hot weather. If your guinea pig is outside then bringing them into a cool home is something that would really help your guinea pig. If you have the capability for doing this, they will benefit from a consistent temperature range and will feel far more comfortable, rather than being outside where they have to retreat to what ever shade they can find. The trouble with shade though, is that if the weather is really hot, it can still be too hot for guinea pigs. As mentioned above, If you are keeping your guinea pig inside, then keeping your home well ventilated means that they are more comfortable in that living habitat and means that you can control the temperature rather than relying on mother nature keep your guinea pigs cool. If they are inside, keeping your guinea pigs away from windows means that they are less exposed to hot weather. The sun’s rays can be extremely hot and quite uncomfortable for guinea pigs to bear, so they will be grateful for a more shady place to live. Hard Plastic cages heat up very quickly in hot weather and will harm a guinea pig if they are in the environment of a plastic hutch because plastic conducts heat quickly. They are much better off in cages like c&c cages that use Coroplast bases which is better for them to stand on, or a wooden base at least. 5. Put a parasol over an outside run/hutch. This is a short term option. If you are finding that the temperature is getting hotter during the daytime, a parasol will help to keep a guinea pig in the shade from the sun’s direct rays. A guinea pig will seek out shade when exposed to the sun’s rays and this way you make it easier for them to seek refuge. Look at where the sun’s rays are positioned throughout the day and re-position their home accordingly so that they are shaded and not exposed to the sun’s direct rays either outside a home or inside. Long haired cavies such as Abyssinian’s are more affected by the warm weather than shorter haired cavies. They can very easily suffer heat stroke as they warm up very easily due to the insulation of their coat. They are far better suited to be indoors where you can control the temperature. Cavies need constant access to water and this need is heightened in summer time when they can very easily become dehydrated. Make sure their water bottle’s are topped up with clean water so that they are always refreshed. Snacks that are high in water such as cucumber and watermelon are also good for them to eat. They are very refreshing for piggies to eat and they do help to refresh them. Air conditioning and fans are great to have in the home during the summer as previously mentioned. They help to regulate the temperature and keep the room temperature at a comfortable level. However, do be careful that the temperature does not go too far the other way and get too cold for your piggies. Anything below 50 degrees farenheit is too cold for them. Placing a thermometer by their home is a good way to monitor what temperature they are living in. If you are using a temporary fan in the piggies environment, make sure it isn’t pointed directly at them but is directed away from where they are. A great idea that is used by many piggie owners is to use an ice pack to help cool them down in the summer heat. Just take an ice pack and wrap it in a towel. Hard plastic ice packs are the best for this type of activity as light plastic is likely to be pierced and will leak. Newspaper is also quite cool for them to sit on and they will enjoy sitting on it. However, it does need replacing quite often as they rip it up quite easily. Placing tiles inside your guinea pig’s home, is a good way of keeping them cool. However, they still need to be kept out of direct sunlight, as they will retain whatever temperature they are in. Ceramic tiles are better as there is less chance the cavy will chew it. Plus they will be good for grinding their nails on. If they are in a cool room, they will enhance that temperature for the piggie. If your guinea pig is inside, keeping out direct sunlight is a good way of keeping out the heat. Don’t worry about it being dark, guinea pigs are very used to being in dark places and have great eyesight for this. Have a number of shelters where they can hide away. In the wild they will try and keep cool by burrowing underground to get away from the sun. Have places they can go to retreat from the sun. Avoid hard plastic houses if you can. Use a cloth and wet it with ice cold water and place it on top of their home to try and cool it down. Pigloos are great hidey places for piggies however due to their hard plastic fabric, they can become very hot in summer. Consider replacing it during the summer, or drilling some holes in the top for air to get through. Fill a water bottle up with ice cold water and place it on top of a guinea pig’s home to help cool it down. Do monitor this though so that they don’t start chewing at it. You can also cover them with fleece or toweling to protect the bottle and tie it. By taking them out of their usual home when it gets hot, put them some where away from the heat such as an empty bath tub to give them respite from the heat. Bathroom’s are usually quite cool places and the guinea pig will appreciate the welcome change of temperature. If you can’t bring your piggie inside, then move their housing to the coolest place you can find. Avoid places where there is direct sunlight, give them plenty of shelters to retreat to. Use some of the tips described above to bring some relief to them and they will be grateful for your intervention. 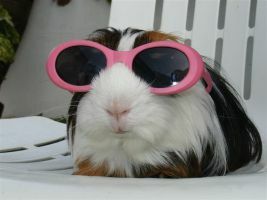 Anyway, I hope that’s given you some ideas for how to keep a guinea pig cool during hot weather. You may have some better ideas, if you do share them below. It’s great to hear what else you guys do to keep your cavies comfortable.